After creating home in every home of the world, Samsung is now going to launch its new product this September. 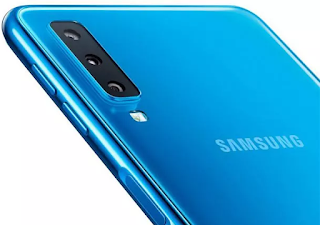 As per to your thoughts, it is another series of Galaxy, yes it is Samsung’s Galaxy A7, the one for which every Samsung user is waiting for. But what new part of “Galaxy” this series offers you, go through this to explore!!! As Samsung has launches this series of Galaxy a third time, they bring some new cool features in this along with a satisfactory price. This new A7 was available in the market from the 27th of September, 2018, exclusively on online shopping websites. Samsung galaxy A7 is the only phone launched by Samsung with integrated fingerprint lock, which is earlier introduced in the market. Instead of this, this phone is available in three major colors, these will be black, blue and gold. Weighting only 168 grams, this new galaxy with two slots on its both sides, in which right one is for dual 4g supportable nano sim and left one is for micro Sd card, up to 512 GB. A 3300 mAh battery is also a good thing in this new Samsung Galaxy A7. The very new Samsung galaxy A7 consisted of 6 inch of full Hd AMOLED display, which gives every color its new life. Instead of this, the Display is termed to be infinite with a good viewing angles. Now this would be a mistake by Samsung where it provides its own Exynos 7885 processor along with android 8.0, which is quite disappointing. Now this is what Samsung brings amazing for its customers. Yes, the new Samsung galaxy A7 consists of three rear view cameras, which are 24 mp, 8 mp and 5 mp respectively, which captures every corner very smoothly. Now the 24 mp camera is fixed while 8 mp camera has 120-degree field of view along with 5 mp camera meant for live view sensor, it means that it enables depth in a photo, which results in the most perfect shot of the world. Beside of its amazing features, Samsung galaxy will be available on two ranges. the very first is with 4 Gb ram with 64 Gb inbuild storage costs Rs 23,990 while the other one with 6 Gb ram and 128 Gb inbuild storage costs Rs 28,990. Both combination has a 512 Gb of micro Sd card storage slot, so space for your selfies along with your favorite game in never gone out of limit.